The Columbia River, fourth-largest by volume in North America (annual average of 192 million acre-feet at the mouth) begins at Columbia Lake in the Rocky Mountain Trench of southeastern British Columbia at about 2,656 feet above sea level. The geographic coordinates at the head of the lake are 50°13’ north latitude, 115°51 west longitude. The river flows north for some 200 miles (322 kilometers) and then turns south and flows for about 270 miles (434 kilometers) before crossing the border into Washington at River Mile 749, that is, 749 miles (1,205 kilometers) inland from the Pacific Ocean. More precisely, according to the BC Freshwater Atlas, the Columbia River in British Columbia is 760.356 kilometers long (472.463 miles). For its first approximately 150 miles (241 kilometers) in the United States, the Columbia forms the reservoir behind Grand Coulee Dam. The river then bends west, south and east through central Washington, turns south and then west, and forms the border between Oregon and Washington to the Pacific Ocean. 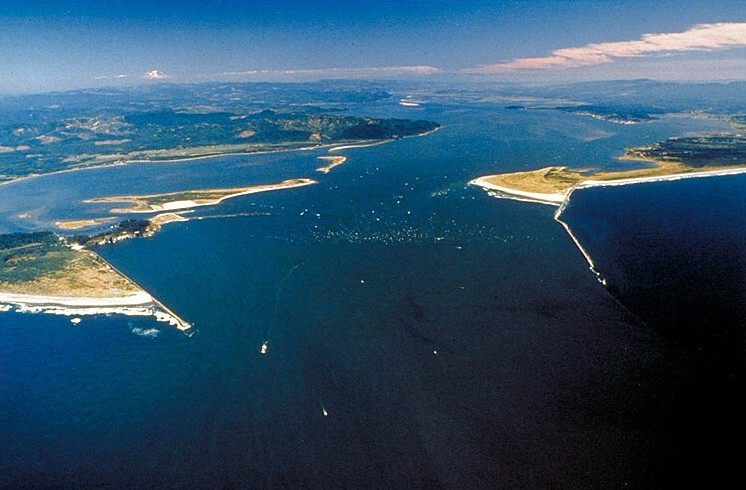 The mouth of the river is about 10 miles (16 kilometers) west of Astoria, Oregon. The geographic coordinates at the mouth (near Cape Disappointment, Washington) are 124.093440 west longitude, 46.246922 north latitude (these are the coordinates the U.S. Army Corps of Engineers cites as River Mile Zero). The total length of the river is about 1,243 miles (about 2,000 kilometers). The drainage basin covers 259,000 square miles (670,810 square kilometers), approximately the size of France, drains portions of seven states and British Columbia, and covers three degrees of latitude and nine degrees of longitude. The Columbia mainstem has numerous tributaries, large and small. The biggest of these, in terms of length and volume, are: longest: 1) Snake (1,078 miles); 2) Kootenai/y (485 miles); 3) Deschutes (252 miles); 4) Yakima (214 miles); 5) Willamette (187 miles). The largest by average annual discharge volume: 1) Snake (54,830 cubic feet per second (cfs) at Ice Harbor Dam); 2) Willamette (33,010 cfs at the Morrison Bridge in downtown Portland); 3) Kootenay/i (27,616 cfs at Cora Linn Dam near Nelson, British Columbia); and 4) Pend Oreille (26,320 cfs at Box Canyon Dam in northern Washington). After that, other tributaries are all under 10,000 cfs annually. Because of its unique situation close to the ocean and laced with tall mountain ranges, the Columbia evolved as one of the great rivers of the world in terms of its runoff and the diversity of its habitat. From its headwaters to its mouth, the river drops steadily at a rate of about two feet per mile, and most of its course is through rock-walled canyons. Down these rocky canyons the Columbia pours prodigious volumes of water, emptying an annual average of 192 million acre-feet into the Pacific; much of its volume originates in its middle and upper reaches. The Canadian portion of the basin, for example, contributes about 20 percent of the river’s total volume (this includes the water from rivers that begin or pass through the United States before entering the Columbia in Canada, such as the Clark Fork/Pend Oreille system and the Kootenay, which is spelled Kootenai in the United States). The combination of high volume and stable canyons made the Columbia an ideal hydropower river. Today there are 14 dams on the mainstem Columbia, beginning with Bonneville at river mile 146 and ending with Mica at river mile 1,018, and more than 450 dams throughout the basin. Dams on the Columbia and its major tributaries, primarily the Snake River, at approximately 1,078 miles its longest feeder stream, produce half of the electricity consumed in the Pacific Northwest. The Columbia River dams inundated many of the river's dangerous rapids, well-described and named by early settlers and travelers on the river for their often treacherous passage -- Dalles des Morts (Death Rapids), Hell Gate, White Cap, Rock Slide, Boulder, Surprise. The huge volume of water pouring to the ocean, most of it during the spring and early summer when the snowpack melts, also produced ideal environmental conditions for cold-water fish, particularly anadromous fish like salmon and steelhead. Other anadromous species in the Columbia include lamprey, sturgeon and shad. But salmon and steelhead are the river’s legacy fish. Between 10 million and 16 million salmon and steelhead are believed to have returned to the river to spawn annually prior to the 1840s, when immigration to the Northwest began to accelerate and pressures on fish, through harvest and habitat destruction, for example, began to take a toll on the runs. Through the 20th century, the number declined to less than 1 million, but the returns began to rebound in the late 1990s, a time when CONSERVATION efforts were increasing in freshwater habitat and ocean feeding conditions were improving. There was a beginning of the Columbia, just as there is a beginning of all things. In one tradition, the beginning is told in myth. In another tradition, the story is one of geology. The mythic could be said to inform the geologic. They are not so different. According to a Yakama legend, the mythical Columbia began, as does the creation story in Genesis, with water. In Genesis, the Earth was formless and empty, and the Spirit of God, the creative force of the Universe, hovered over the water. In the Yakama legend, the hovering spirit, Whee-me-me-ow-ah, the Great Chief Above the Water, reached down from the sky where he lived and scooped handfuls of mud from the shallow places and made the land. Some of the mud he piled high to make mountains, and some of it he made into rocks. He made trees and roots and berries grow on the land, and he made man from a ball of mud. He gave the man instructions about hunting and fishing, and when the man became lonely the Great Chief Above made woman and taught her how to gather and prepare berries, and cook the salmon and game the man brought to her. He blew his breath upon her and made her skilled in these things so that she could teach her daughters and granddaughters. Coteeakun, an associate of Smohalla, the great Yakama prophet, told this version of the creation to Major J.W. MacMurray of the U.S. Army when he was stationed among the Yakama in 1884-85, according to author Ella Clark. It may be an accurate retelling of a story handed down through generations, or with its distinctly Biblical tone it may be influenced by the work of Christian missionaries of the time. Other Northwest tribes have similar oral traditions about the creation of the world, usually involving a benevolent Chief Above and the creation of distinct levels -- underworld, earth and sky -- linked through the middle in some way, as by a pole, a tree or a waterfall. Humans also were divinely created by the Chief Above or, in some traditions, by his agent Coyote. The Columbia itself was the work of Coyote in most oral traditions. Realizing that salmon were in the ocean and that people in the interior needed food, Coyote fought a battle with the giant beaver god Wishpoosh, backing him through the Cascade Mountains to the ocean and then killing him. It was the back-and-forth slashing action of the great beaver’s tale that scraped out the Columbia River Gorge and opened the channel to the sea. This made salmon available to the people. Coyote cut the beaver to pieces and distributed the pieces on the land, and they became humans. Later, Coyote tricked the five swallow sisters, who had built a dam across the river to block salmon, into leaving him alone there. While the sisters were away, he destroyed the dam, again freeing the way for salmon. The rocks of Celilo Falls were the remnants of the dam. Thus we have the Columbia River and salmon. There are other legends about the origin of the river and its people, legends that also coincide with the geology and ecology of the river as we know it today. There were cataclysms of volcanism, floods and earthquakes. Humans migrated over great distances around the northern rim of the Pacific Ocean and from the continental Northeast to settle here, along the Columbia. The geologic history of the modern Columbia River Basin could be said to have its origin in the Yakima Basalt of the Columbia River Basalt Group, the greatest outpouring of lava in the history of North America, which spread across western Idaho and eastern Washington and flowed to the Pacific Ocean between 6 million and 16 million years ago. The repeated basalt flows formed the area we know today as the Columbia Plateau of central Washington and Oregon. The ancient Columbia, which once entered the ocean near present-day Coos Bay, Oregon, was forced north and west by the repeated flows. The sheer weight of some 90,000 cubic miles of basalt, layered in more than 200 separate flows, gradually depressed the Earth’s crust and shaped the Columbia Basin, sloping inward from perimeter elevations of 2,000 to 4,000 feet above sea level to less than 500 feet in the Pasco Basin of south central Washington. Beginning about 12 million years ago, the pressure began to warp the basin into the characteristic east-west folds that are the modern-day tributary river basins. It is something of an irony that the rich farmland of the Columbia Plateau, known as the Palouse Formation, resulted from extremely arid conditions between the advance and retreat of glaciers during the last Ice Age. During the interglacial warm periods, winds deposited glacial dust and silt up to 150 feet deep in some places. Geology and mythology need not be mutually exclusive. Neither tradition needs to be more right than the other. What is important is the river had a beginning, and that in the beginning, before everything else, there was water. In the 16th century, somewhere in the north of New Spain, in the mists of imagination and the heat of the desert, lay seven cities of legendary wealth. These were unimaginably rich with turquoise, silver, gold, and furs, or so the Spanish conquistadors believed as they plundered, proselytized and steadily pushed deeper into the wilderness. By land and by sea, Spaniards pushed west and north across the land they called New Spain — present-day Mexico — searching for the fabulous wealth. Some 60 years after the first Spanish colonies were established in New Spain, Sir Francis Drake sailed from Plymouth, England, on Dec. 13, 1577, with 100 men and three ships: the Pelican, Elizabeth, and Marigold. Officially, he planned to explore “Terra Australis Incognita,” the Unknown Land of Australia, as a possible site for colonization. He also planned to search for the western entrance to the Northwest Passage. Privately, he had Queen Elizabeth’s permission to loot any Spanish ships he might encounter. Storms in the Strait of Magellan sank the Marigold and forced the Elizabeth to turn for home. Drake continued in the Pelican, which he renamed the Golden Hind. In 1579, having traveled half way around the world, and after robbing a number of Spanish ships to the point that his own Golden Hind was heavily burdened with stolen gold and silver, precious gems and jewelry, Drake sailed north along the Pacific coast. On June 3, the Golden Hindis believed to have reached at least 42 degrees north latitude (northern California) and perhaps as far as 48-50 degrees (northern Washington or Vancouver Island). He turned back and found a harbor, probably just north of San Francisco Bay, where he landed to repair his ship and take on water and food before sailing west across the Pacific and home. Meanwhile, Spain’s quest for gold and territory in the Northwest continued, with the next explorers reaching the present-day Oregon coast in January 1603. Through these early explorations, the Pacific Northwest began to emerge from the mists of imagination. The Northwest was becoming a known place on crude maps, but despite the lure of the imagined Northwest Passage more than 100 years would pass before Spain or any other nation would attempt such an exploring voyage again. On July 11, 1775, Bruno Heceta in the Sanitago and Juan Francisco de la Bodega y Quadra in the Sonora, exploring north from San Blas, a Spanish port on the Pacific Coast a short distance north of present-day Puerto Vallarta, reached 48° 26’ north, on the west coast of Vancouver Island, then turned back south. On August 15th, Heceta and Quadra arrived at the mouth of Columbia after having lost part of their crew in a skirmish with Indians on the Olympic peninsula. Many of the remaining crewmen were weak with scurvy. In the course of that night, I experienced heavy currents to the south-west, which made it impossible to enter the bay on the following morning, as I was far to leeward. These currents, however, convinced me that a great quantity of water rushed from this bay on the ebb tide. The two capes which I name in my plan, Cape San Roque and Cape Frondoso, lie in the angle of 10 degrees of the third quadrant. They are both faced with red earth and are of little elevation. In 1778, Captain James Cook, the famed British explorer who made three voyages to the Pacific, missed the mouth of the Columbia altogether. Arriving on the Pacific coast after having discovered the Hawaiian Islands, which he named in honor of his friend the Earl of Sandwich, Cook first sighted land in the vicinity of Newport, Oregon, on the present-day central Oregon coast. He described the land and named Cape Foulweather, a few miles north of Newport, and then, having accurately described the weather in the naming of the rocky headland, was blown out to sea and did not see land again for about two weeks. [We were] “unprofitably tossed about for the last fortnight” he wrote in his journal for March 21, 1778. Cook followed the coasts of present-day British Columbia and Alaska to the Aleutian Islands and the northern Bering Sea, where he was stopped by ice. He was searching for a Northwest Passage to the Atlantic and did not fit one, but his crew traded for sea otter pelts on the Alaskan coast and later sold the furs at Canton for a huge profit. Word of the value of sea otter pelts — they were softer and finer than any other fur at the time — spread fast, and the huge profits were confirmed in the official report of Cook’s voyage. Soon British traders in India and Canton were outfitting ships for trading expeditions to the Pacific coast, as were other entrepreneurs in the United States and Europe. All of these explorers missed the mouth of the Columbia until John Meares sighted it in July 1788 while on a fur-trading voyage from Nootka Sound. Meares sighted and named Mount Olympus and then coasted south to take a look at the big bay and surge of fresh water discovered by the Spaniard Heceta in 1775. Meares was a former British naval officer who first visited the Northwest coast two years earlier on a voyage in search of sea otter pelts. He arrived off the mouth of Heceta’s bay on July 5. He attempted to cross the bar, but encountered huge and dangerous breakers. Then he stood off, waiting for the sea to calm and eventually decided there was no river. On July 6, 1788, he named the northern cape Disappointment, a name that stands to this day. He named the bay Deception. He wrote in his journal, “We can now assert that there is no such river.” He arrived back at Nootka on July 26. Four years later, he would be proven wrong. At 4 a.m., April 29, 1792, just inside the entrance of the Strait of Juan de Fuca off the Northwest coast of present-day Washington, two great sea captains had a brief encounter that literally changed the course of Columbia River history. One was an American, fur trader Robert Gray of Boston, and the other was British, Captain George Vancouver. On the south side of the promontory was the appearance of an inlet or a small river, the land behind not indicating it to be of any great extent; nor did it seem accessible for vessels of our burthen, as the breakers extended from the above point, two or three miles into the ocean, until they joined those on the beach nearly four leagues further south. The Sea had now changed from its natural, to river-coloured water; the probable consequences of some streams falling into the bay, or into the ocean to the north of it, through the low land. Not considering this opening worthy of more attention, I continued our pursuit to the N .W., being desirous of embracing the prevailing breeze. The Discovery made signal we were standing into danger and we hauled out; this situation is off Cape Disappointment from whence a very extensive shoal stretches out and there was every appearance of an opening actually seen, but it was passed without appreciating the importance of the place. It may not have been so much that Vancouver did not appreciate the importance of the place but that he considered the opening too small or dangerous, and to investigate would have violated his specific orders. He had two primary tasks. One was to receive restitution from Spain for the land and buildings at Nootka on what is now Vancouver Island. British possessions there had been seized by Spain in 1789. The other, and more important task, was to search the Pacific coast as far north as 60 degrees for the opening of a Northwest Passage, and he was advised against pursuing “any inlet or river further than it shall appear to be navigable by vessels of such burden as might safely navigate the Pacific Ocean.” Vancouver considered the Discovery too large for what he perceived as a shallow and dangerous opening to a supposed river. The river Mr. Gray mentioned should from the latitude he assigned to it, have existence in the bay south of Cape Disappointment. This we passed on the forenoon of the 27th; and as I then observed, if any inlet should be found, it will be a very intricate one, and inaccessible to vessels of our burthen, owing to the reefs and broken water which appeared in its neighborhood. Mr. Gray stated that he had been several days attempting to enter it, which he at length was unable to effect in consequence of a very strong outset ... I was thoroughly convinced, as were also most persons on board that we could not possibly have passed any safe navigable opening, harbor or place of security for shipping on the coast, from Cape Mendocino to Classet ... nor had we any reason to alter our opinions. At four A.M. saw the entrance of our desired port. … When we were over the bar, we found this to be a large river of fresh water, up which we steered. At one, P.M., came to with the small bower, in ten fathoms, black and white sand. … Vast numbers of natives came alongside. … So ends. Indians came to meet Robert Gray’s Columbia Rediviva in the estuary. Illustration: Joan Barbour. Gray anchored one-half mile off the north shore of the estuary between modern-day Point Ellice and McGowan’s Station. Thus the Columbia became — and remains — an American river. The American government was well aware of Gray’s expedition. He carried an official letter of introduction from the president, George Washington. Just as easily, the Columbia could have been British, but first Meares and then Vancouver insisted it was either nonexistent or insignificant. These were well-accomplished explorers, Vancouver particularly so. Why were they so adamant in spite of intriguing evidence of a great river? The answer might be, in a word, arrogance. Meares simply was convinced he was right. As for Vancouver, Historian Richard Speck suggests that while brilliant and well-experienced as an explorer, Vancouver was a victim of his own “towering pride.” Despite the information he gleaned from Gray, Vancouver believed, by his own observations, that there were no ports or rivers of significance between Mendocino and Cape Flattery. Speck suggests that Vancouver, as a British naval officer, also probably was quite right to disregard the information of a “Yankee tramp trader” about the mouth of the Columbia. If Vancouver can be criticized, Speck suggests, it would be for his refusal to heed the obvious signs of a great river -- discolored ocean water, floating debris, a strong current pushing out to sea. Regardless, he effectively threw away the discovery by which Great Britain could have claimed all of Old Oregon. If not for this, the state of Washington north of the Columbia River might be part of Canada today. A more sympathetic explanation of why Vancouver dismissed the mouth of the Columbia is provided by British Columbia historian Barry Gough, who believes that the Admiralty urged Vancouver to use his judgment and be cautious in order to save time and to devote the voyage to the task of discovering the western opening of a Northwest Passage connecting the Atlantic and Pacific oceans. Gough writes that in order to be commercially and strategically useful, the passage had to be large, and to Vancouver the opening of the Columbia did not appear large. As well, Gough suggests, Vancouver may have placed too much confidence in Meares’ earlier conclusions. Gough also notes that Vancouver was “distressed” that Gray had discovered the river, and that Vancouver later had Lieutenant Broughton of the Chatham survey the river about 120 miles inland in the hope of extending British claims. That was in October 1792, when Vancouver, having been presented a copy of Gray’s chart of the Columbia by the Spanish commander at Nootka, decided that on his way to the Sandwich Islands, where he planned to spend the winter, he would investigate the river. For two days he looked for a channel safe enough for the Discovery. Finding none, he ordered Broughton, commanding the smaller Chatham, to investigate the river. … by triangulation, computation and divination Broughton scaled this down to fifteen miles and decided that up to here the river had not narrowed enough to be called anything but a sound. A freshwater sound that opened on the ocean would be unusually interesting geography but it would do to peg down an imperial claim. Broughton anchored the Chatham in the estuary and went on upriver with a crew in the ship’s longboat, naming sites including Puget Island and Mount Hood (Vice Admiral Samuel Lord Hood signed the orders for Vancouver’s expedition). Along the way, he and his crew traded with Indians for salmon. These included three fish acquired at a Chinook village on the 21st. Some authorities suggest the latter quotation was fabricated for diplomatic purposes because Great Britain later used it in boundary negotiations with the United States. Speck writes: “[Vancouver] had unhesitatingly laid absurd claims to Spanish lands far south of any reasonable boundary, and now his lieutenant baldly claimed for England a river which had been discovered by another nation.” Broughton’s deceit was the basis of Great Britain’s tenuous claim to the Columbia until the boundary matter finally was addressed, first in the Convention of 1818 that established joint possession of the Northwest and ultimately in the Treaty of Oregon, which the two countries signed in June 1846. The treaty fixed the border at the 49th parallel. According Gough, “Vancouver’s failure to discover the river plagued British diplomats, who in discussions with their American counterparts were obliged to base their priority of claims on the basis of the earlier, more cursory discoveries of Drake and Cook.” Historian Glyn Williams writes that the “one serious blemish” on Vancouver’s 1792 expedition to the Pacific Northwest coast was that he failed to understand the significance of several major rivers, including the Fraser and Columbia. Nonetheless, Vancouver conducted such a thorough survey of the coastline from the Strait of Juan de Fuca to southeastern Alaska that 100 years later his maps were still in use. “He proved there was no Northwest Passage in these latitudes, but he inadvertently left the Columbia River for others,” Williams writes. Sent the cutter and found the main Channel was on the South side, and that there was a sand bank in the middle, as we did not expect to procure any Otter furs at any distance from the Sea, we contented ourselves in our present situation, which was a very pleasant one. I landed abreast the Ship with Captain Gray to view the Country and take possession, leaving charge with the 2nd Officer. Found much clear ground, fit for Cultivation, and the woods mostly clear from Underbrush. To this day there is a remnant of the British and American explorations in the names of the two capes at the mouth of the river. Cape Disappointment on the north side was named in 1788 by John Meares, the British explorer (Gray’s “Cape Hancock” did not stick); Point Adams on the south side was named in 1792 by the American, Robert Gray, for John Adams, vice president of the United States who was elected to a second term that year. Aerial view of the mouth of the Columbia River. Photo: U.S. Army Corps of Engineers.